Previous PostFriday MomentNext PostHappy Birthday, David! This little bird is so cute but I loved the ones who knew you so well they ate cranberries from your hand and would peek in the kitchen window to remind you to come out with their treats. Never forget the landing on your inside Christmas tree and the one in the garage on a bicycle waiting for you. Momma let all of us peek in her nest to see her babies, too. What memories!! Is that a young mockingbird? 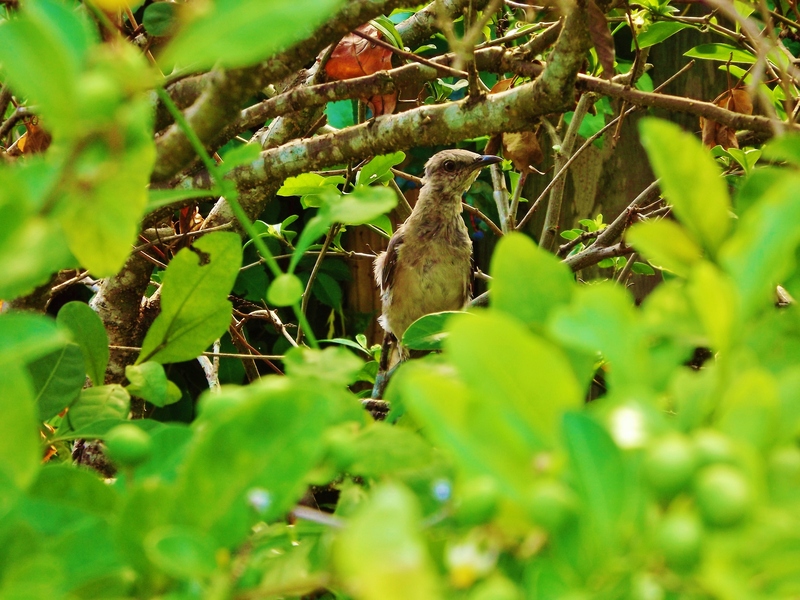 I love that little bird there…it’s such a refreshing sight…new life! Yes! It was upset with me standing so close yet didn’t fly away for a while! What a great moment! You had a good eye to spot that little guy in the brush like that. Looks like a young guy… that really is a bright shade of green..
Oh yes, a young one it was :-). What a cute baby! Thanks David! He was well camoflauged but not very high up :-). We were at eye level! They can be very territorial but some of them become familiar with you and allow you to even look in their nests or eat out of your hands (as I have experienced). It’s completely changed how I saw these birds! They are incredibly intelligent! Perched proudly on that branch! Awe, what a sweet photo. Great moment. He was not happy with me but he was safe :-). LOVE your moment! What a beautiful photo! I love all the greens! Here everything is so dull and grey! Lovely to see this!